We would like to thank Andy Payne of J & A Road Sweeping, Digger and Dumper Hire from Eyam, who provided the machinery at preferential rates, and also Alan Bettney from DCC highways who was extremely helpful and assisted in arranging the loan of road warning signage for safety. Andy provided a digger and dumper to remove the build-up of soil covering part of the pavement which was significantly narrowing it. This along with the vegetation was reducing the pavement to a single width walkway in places. 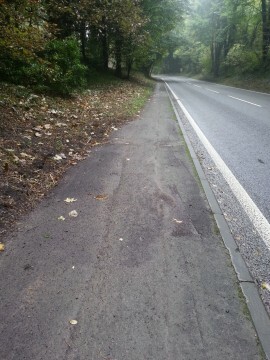 The pavement in question runs from the Lovers Leap to the junction of Eyam. It was hoped that the whole stretch would be completed during the day, but unfortunately only half that length was completed. However due to the massive improvement and the positive comments received, we have committed to complete the task which will be done in due course. (Picture below shows the improvement achieved). The improvements inspired further activity including strimming and tidying, the result is a very much improved entrance to the village which we hope everyone has noticed.